(Newser) – After 35 years in a psychiatric hospital, John Hinckley Jr. is a free man. The Telegraph reports the would-be assassin of Ronald Reagan was released Saturday from St. Elizabeth's psychiatric hospital after a judge ruled in August that the 61-year-old was no longer a threat to the public or himself. Doctors say the depression and psychosis with which Hinckley was diagnosed following his 1981 assassination attempt are in remission, according to Reuters. 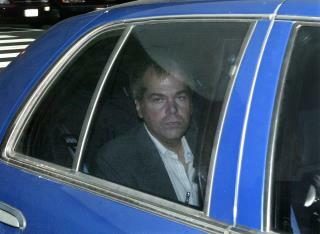 Hinckley pleaded insanity after wounding Reagan and three others outside a Washington DC hotel. He was attempting to impress actor Jodie Foster, with whom he was obsessed. Hinckley's release was strongly objected to by Reagan's family, including his daughter, who fears Hinckley still has "dark agendas." That seems unfair for Manson, we should let him out too. Hillary could use the vote. The only saving grace I can see is we no longer have to pay his bills.